I made the potato gnocchi from scratch, it is labor intensive but I have to say it was worth all the effort! 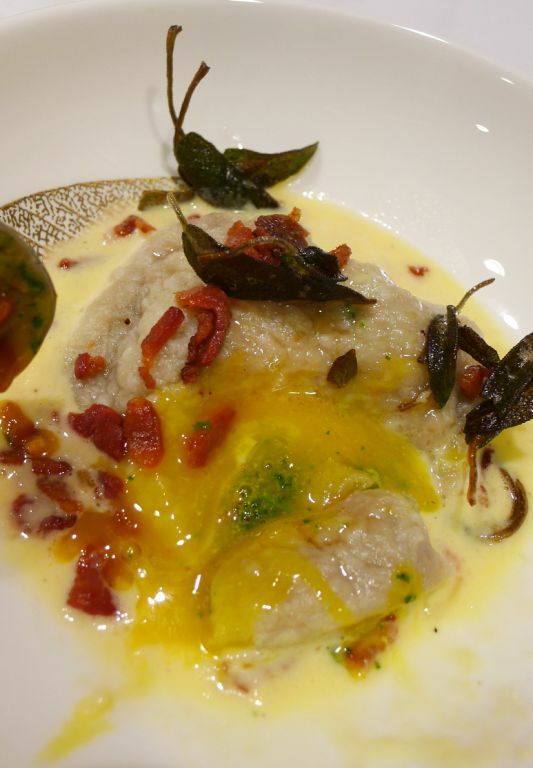 In this recipe an egg yolk is slip inside each ravioli and filled with swiss chard and ricotta cheese. 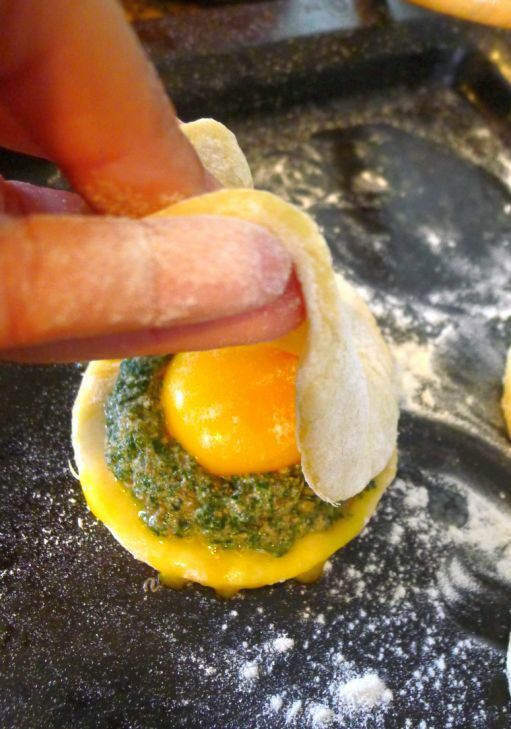 Your guests will be so surprise when they cut into the ravioli and see the egg yolk oozing out! Originally this recipe called for a brown butter sauce but I went with a carbonara sauce instead because I though the brown butter sauce is just too rich. 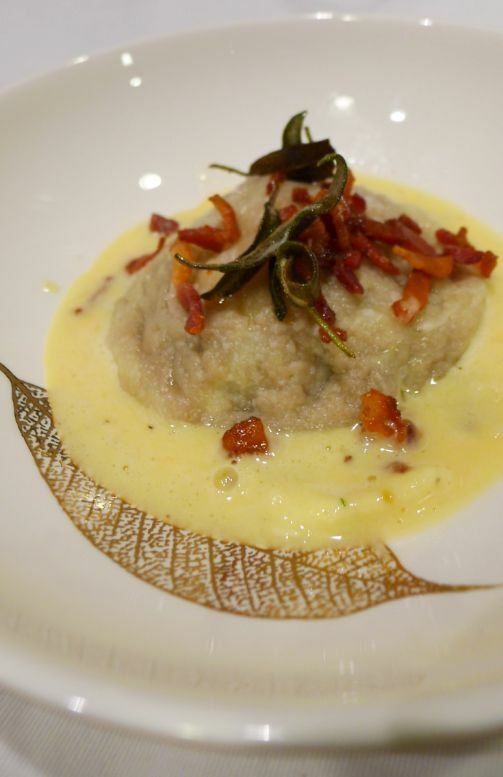 The crispy bacon add the extra salted needed to the dish to make it interesting and the brown crispy sage has also a very interesting texture. 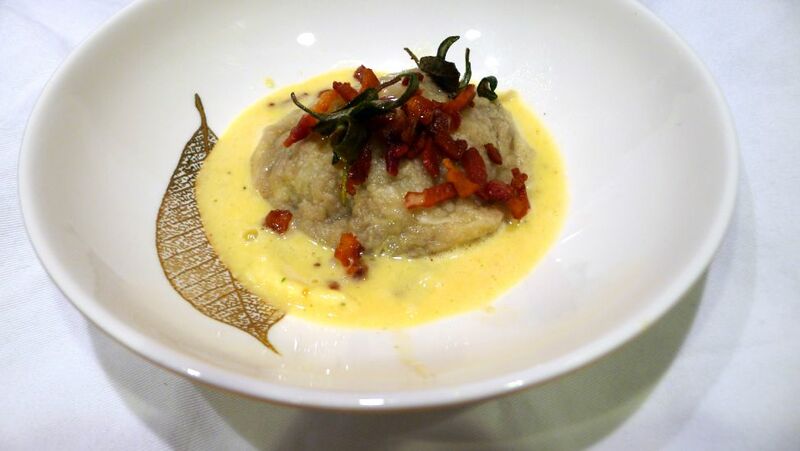 All components worked well together to form a really delicious potato gnocchi ravioli dish. I like the final presentation of the dish! 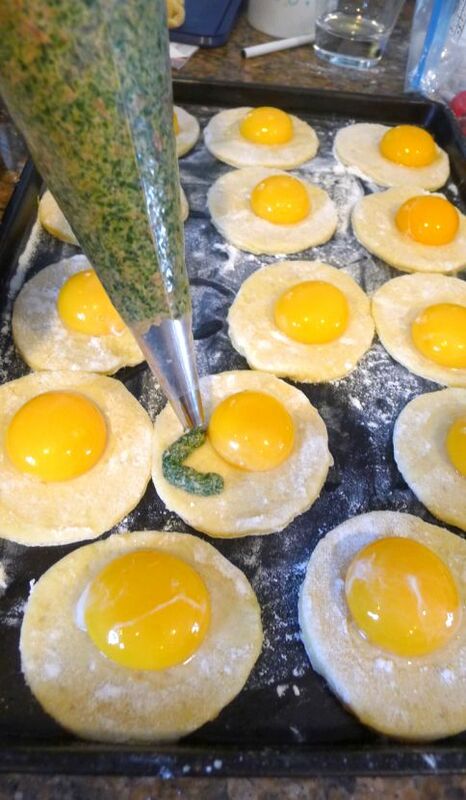 Cutting into the ravioli and right away you can see the egg yolk oozing out! 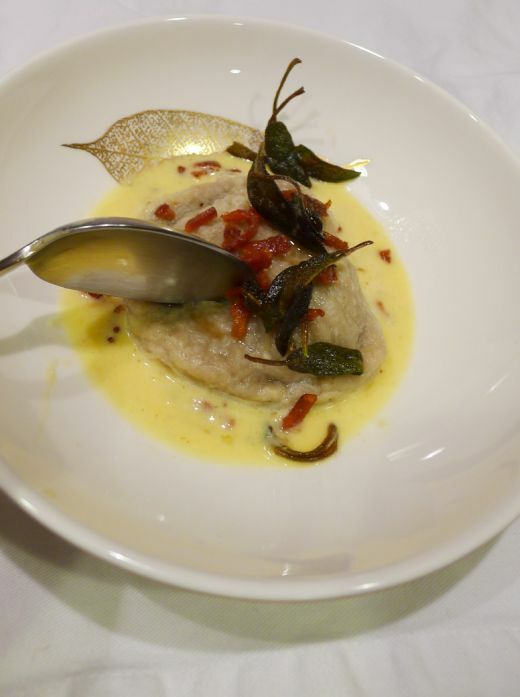 I served this dish at my Italian tasting menu and everyone was so surprise to see the running egg yolk. Note: this recipe is for 6 but since I have 14 guests I doubles the recipe. 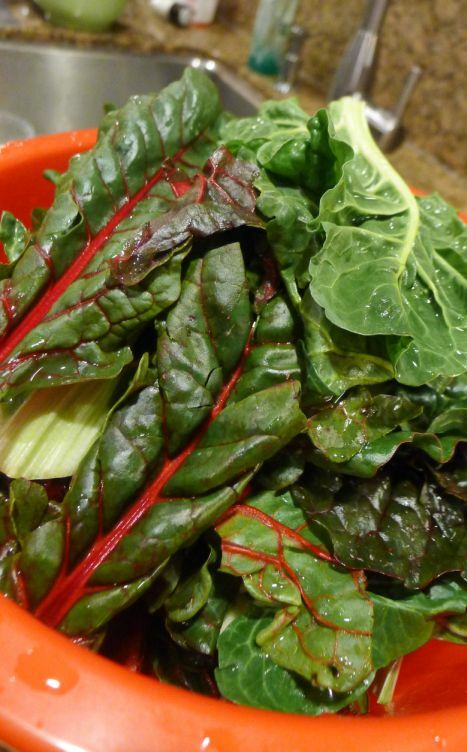 Clean and your Swiss chard and cut off the stem if they are tough. 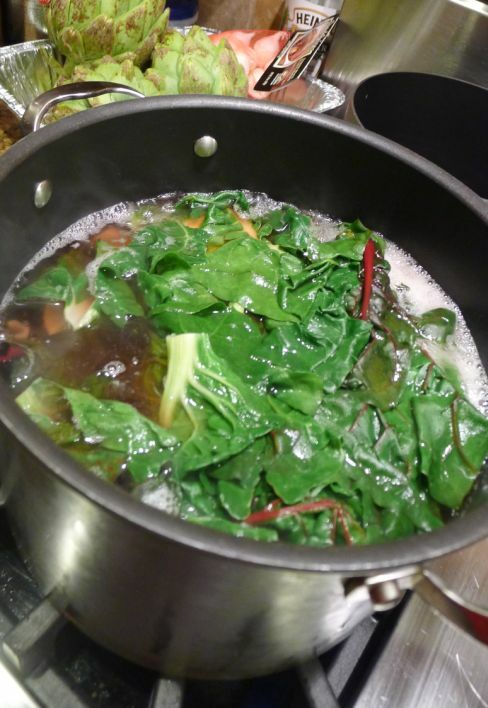 Bring a large pot of salted boiling water and drop the Swiss chard in the pot. 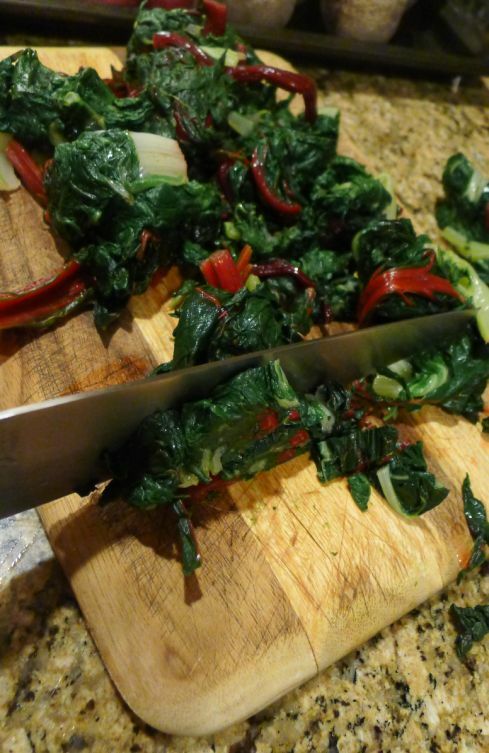 Blanch the Swiss chard for about 3 minutes. 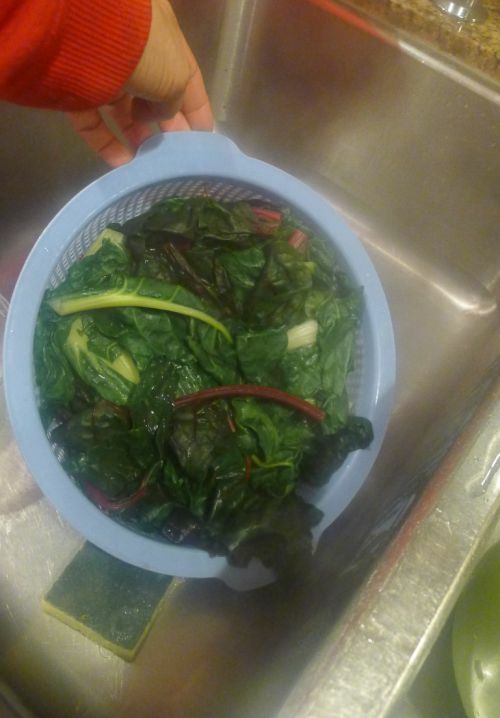 Drain the Swiss chard into a colander. 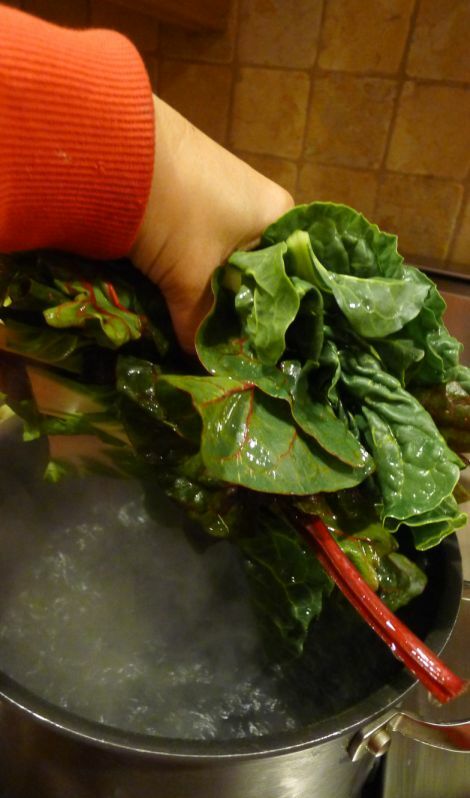 plunge the Swiss chard in a ice bath. 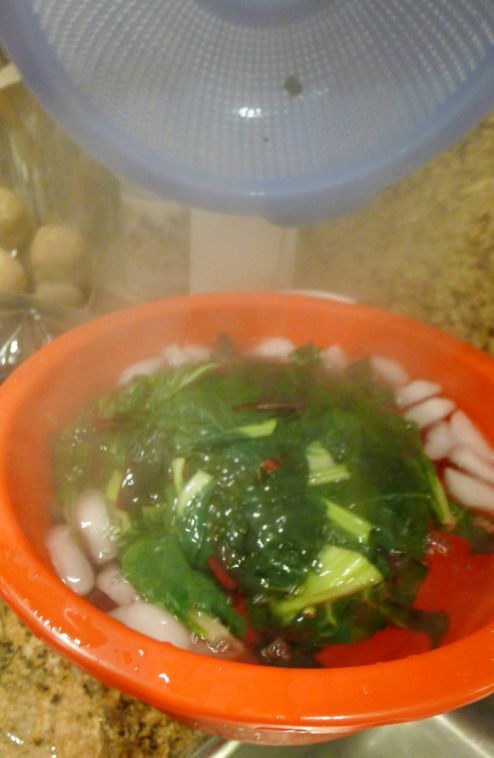 Drain again and squeeze out as much water as possible. 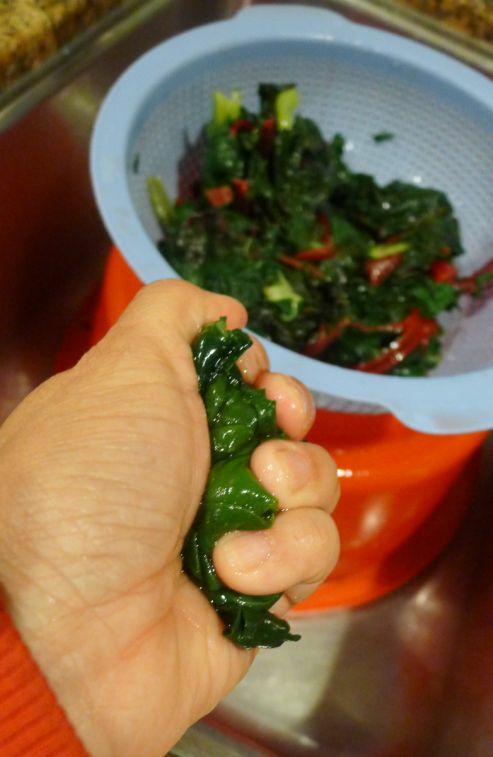 Chop the Swiss Chard coarsely and transfer it to a food processor. 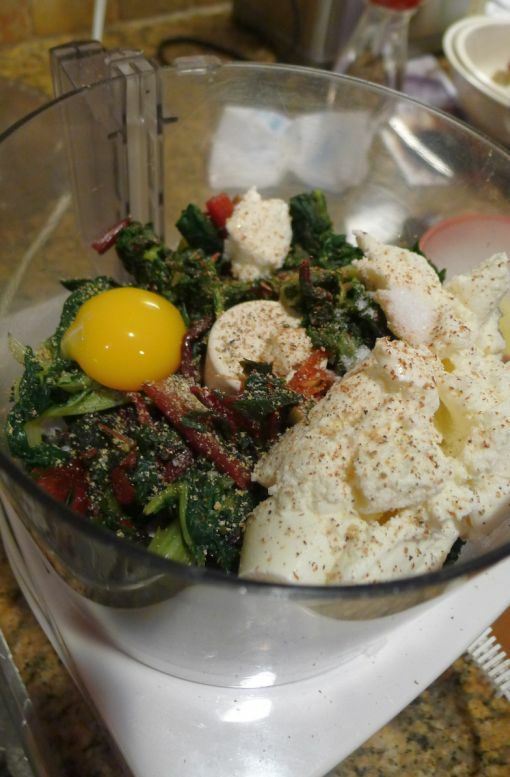 Add the drained ricotta, egg yolks. nutmeg, salt, pepper and pulse. 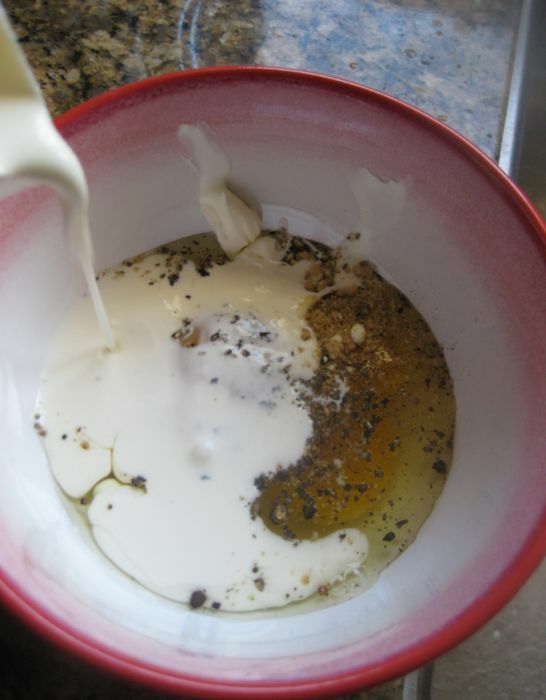 Taste the filling and make sure it is well seasoned with salt and pepper. Set aside or refrigerate until ready to use. Preheat oven at 375 degrees. 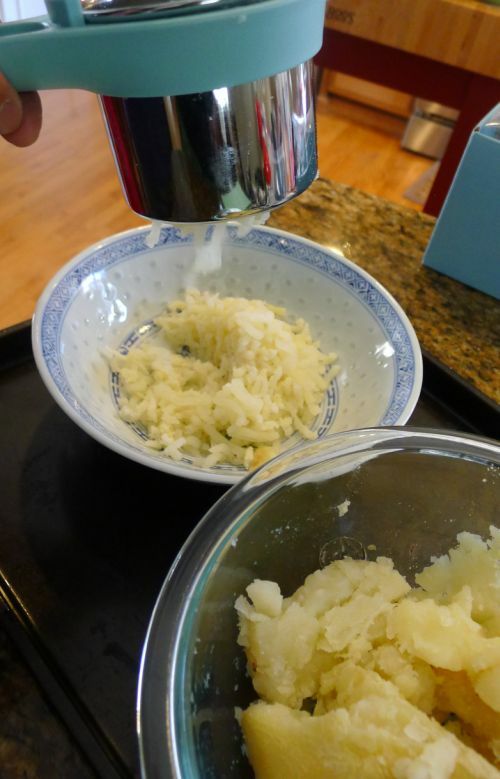 pierce the potatoes and bake until tender when pierce with a knife , about 70 minutes. Remove from the oven and let cool just enough to handle. 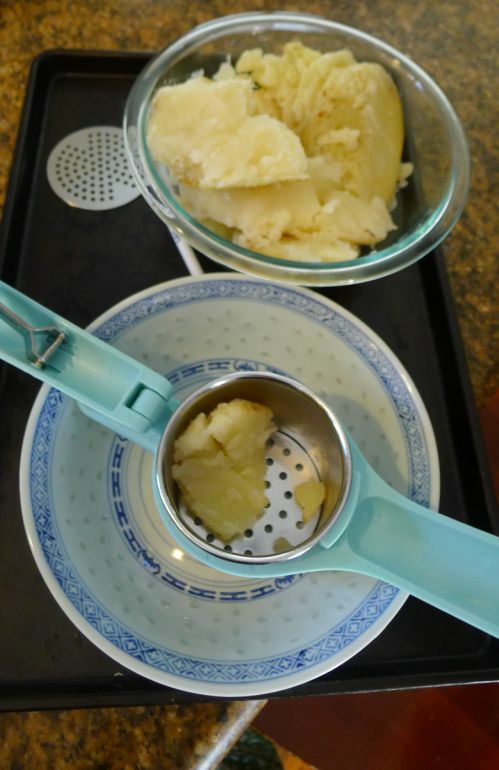 Cut each potato in half, scoop out the flesh and put through a food mill into a bowl. You have about 2 cups. 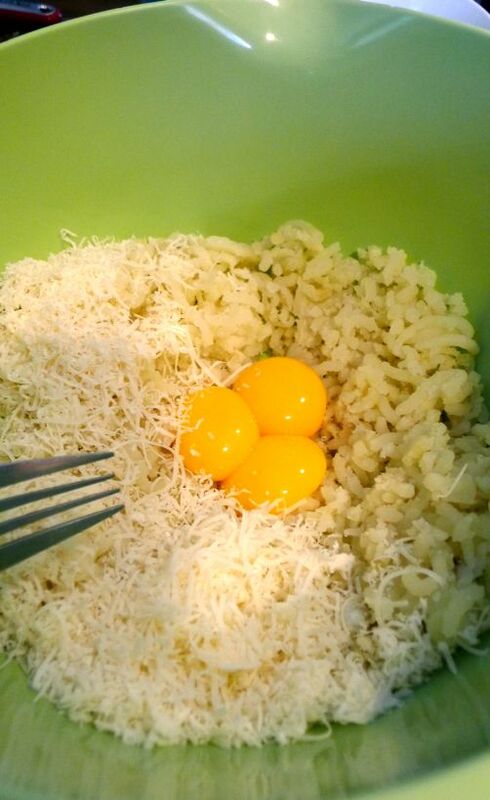 put the potato in a large bowl, add the 3 egg yolks, parmesan cheese and mix it together. 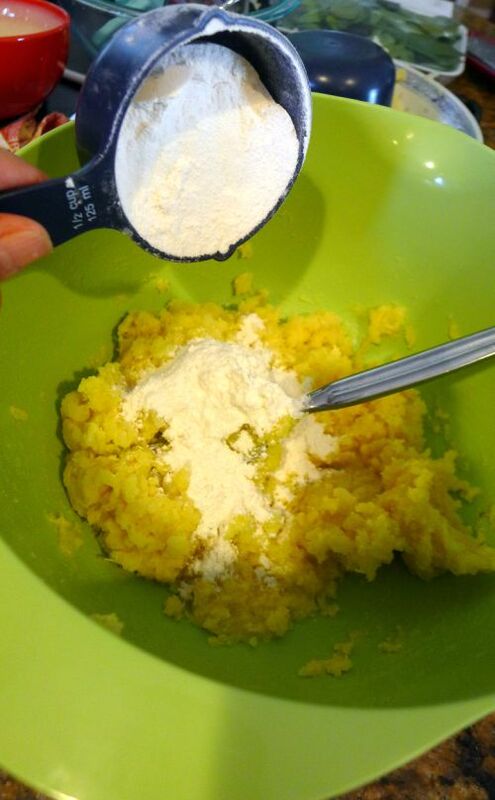 Add the flour, 1/2 cup at a time and gently mix it together. 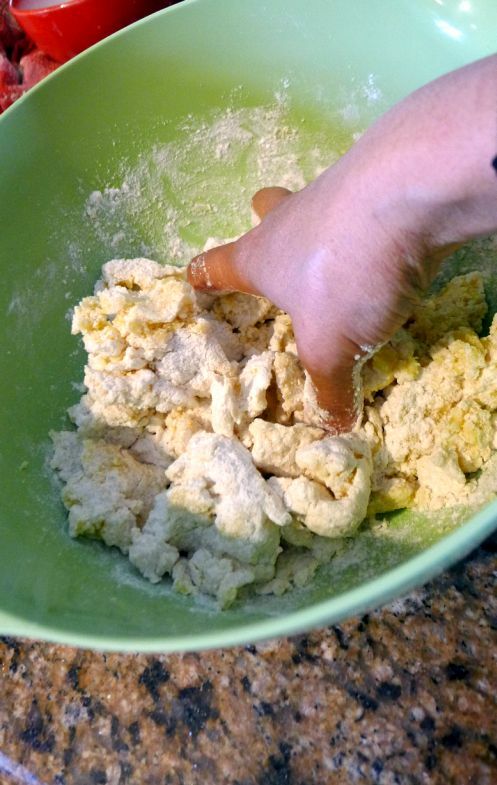 gently knead just until the dough becomes a cohesive mound, about 3 minutes. The dough should feel firm but yielding. Cover and let it rest about 30 minutes. 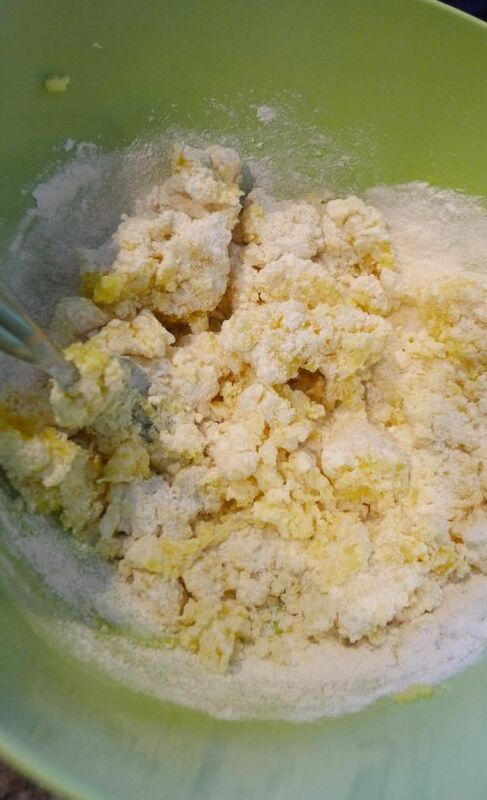 On a floured surface, roll the dough until it forms and oval about 1/4 inch thick. 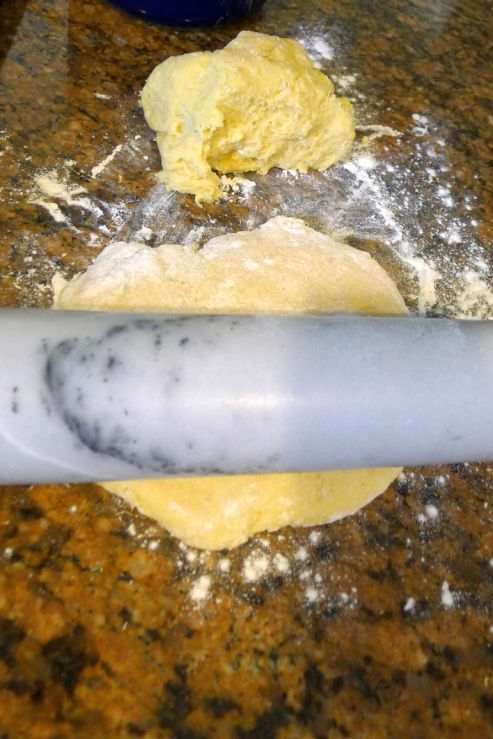 With a 5 inch round pasta cutter cut 12 rounds from the dough. 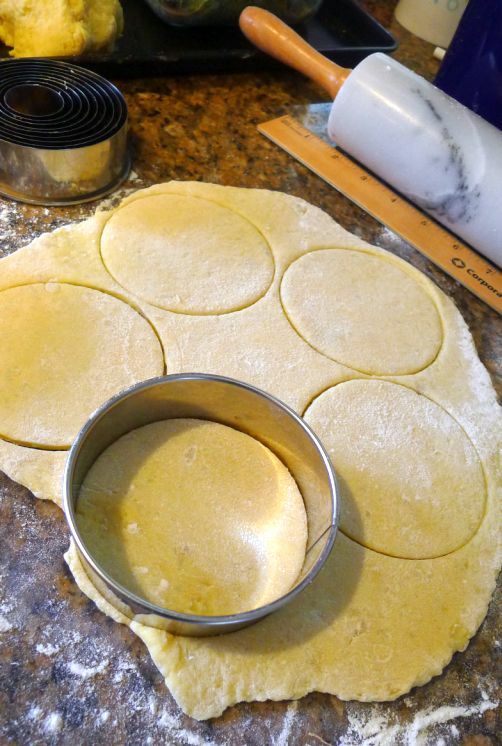 If you need to push together the dough scraps and re-roll until smooth and cut more rounds. 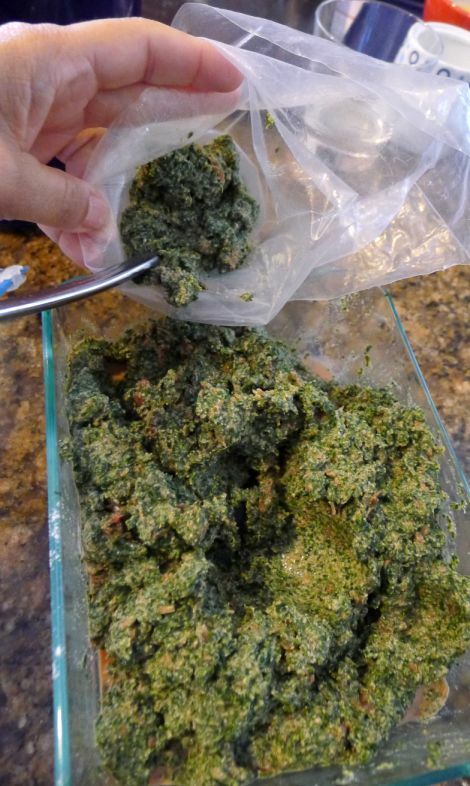 Remove your Swiss Chard, ricotta filling from the fridge and put it inside a piping bag. on 6 of the dough rounds, put an egg yolk in the center and pipe the filling around the egg yolk leaving about 1/2 each from the edge. You should only have only 6 but since I doubled the recipe I have a lot more. 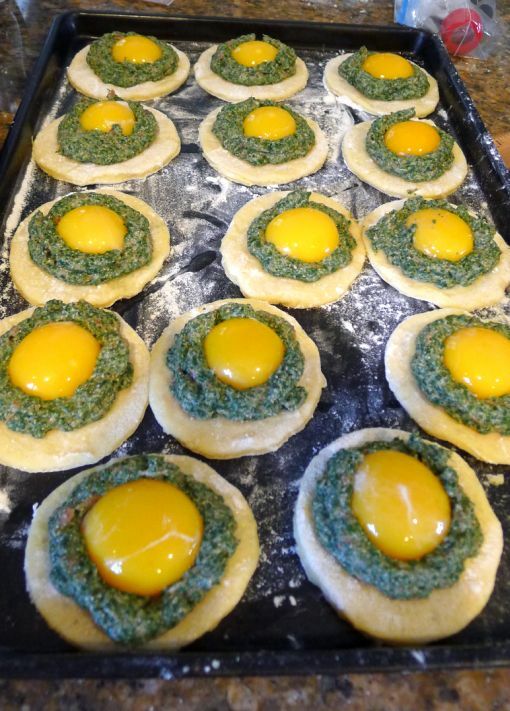 Brush the egg water mixture around the edges of each dough round. Top with another dough round. 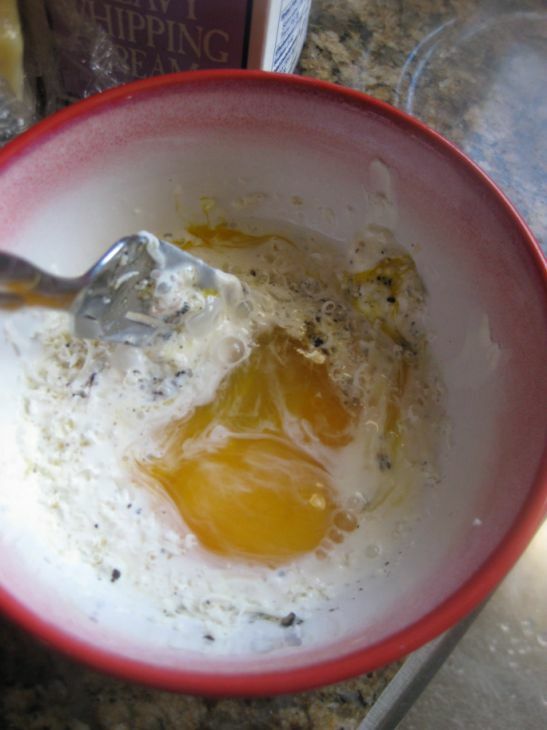 With your fingers seal it all the way around, gently so you don't break the yolk inside. 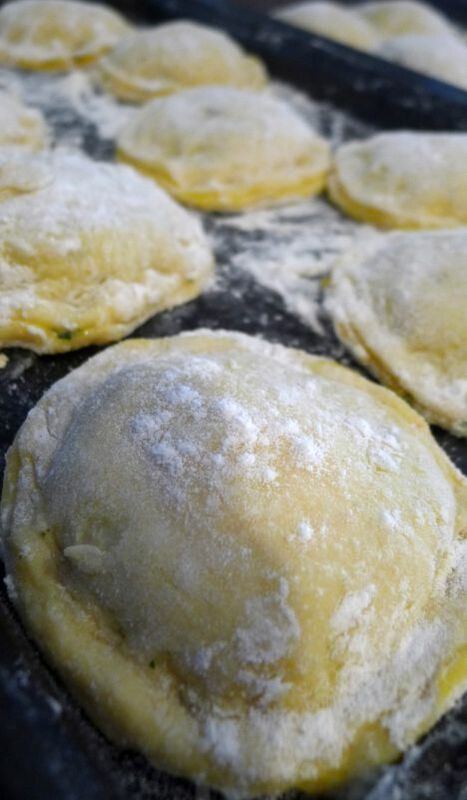 Transfer the ravioli to a floured sheet pan and refrigerate for at least 30 minutes or up to 6 hours. 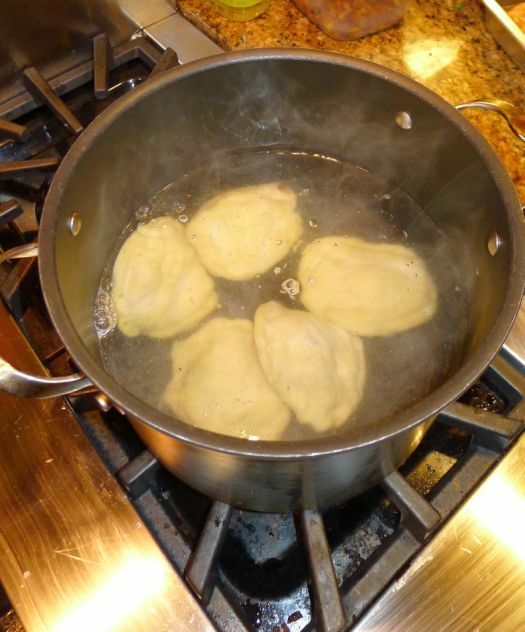 Bring a large pot of salted water to a boiling point and drop in the ravioli. Don't over crowd your pot. 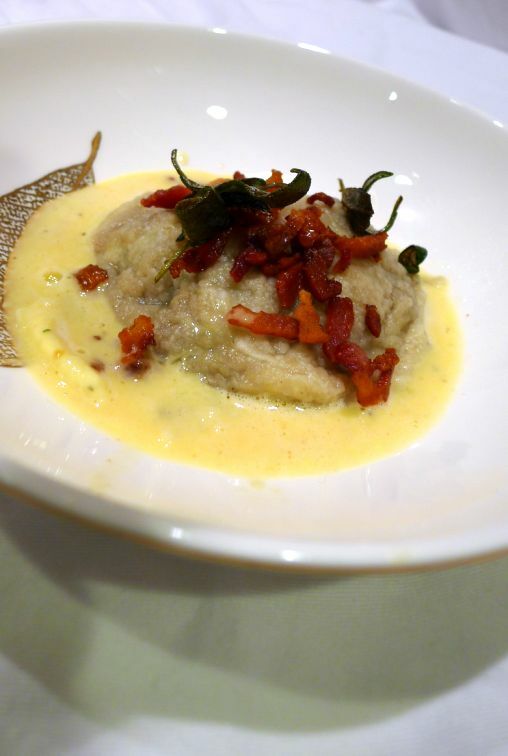 The ravioli are ready when they float to the top. 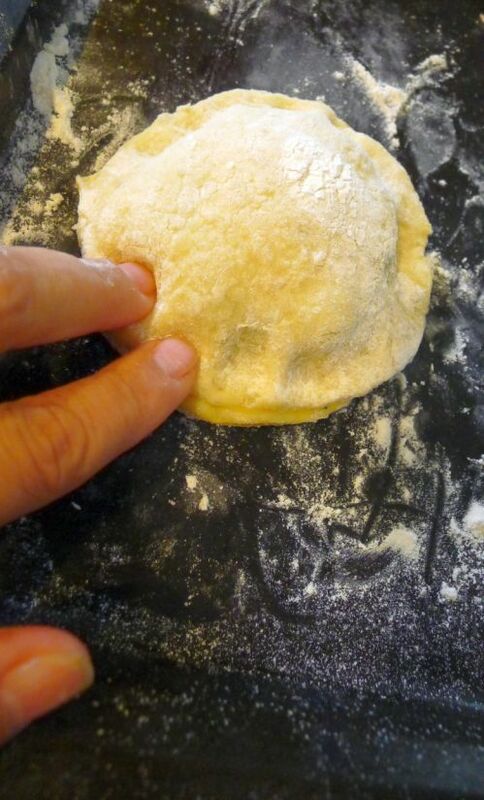 I am starting to plate the ravioli. Put a ravioli in the center of a bowl. 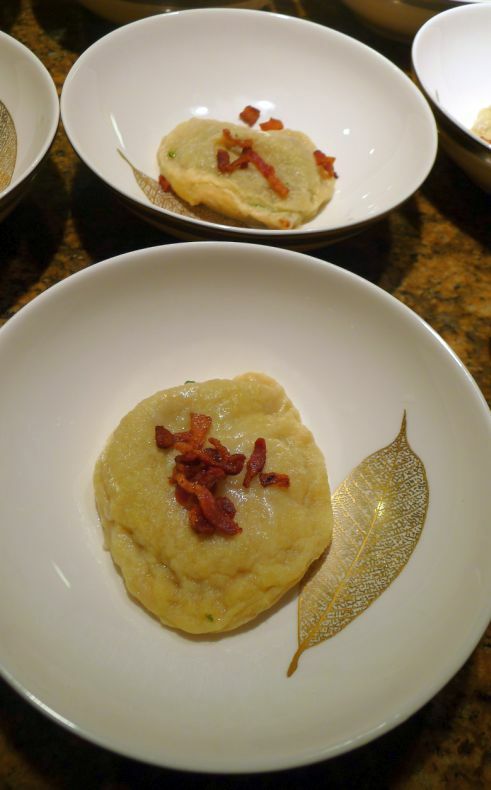 Add the crispy bacon and crispy sage. 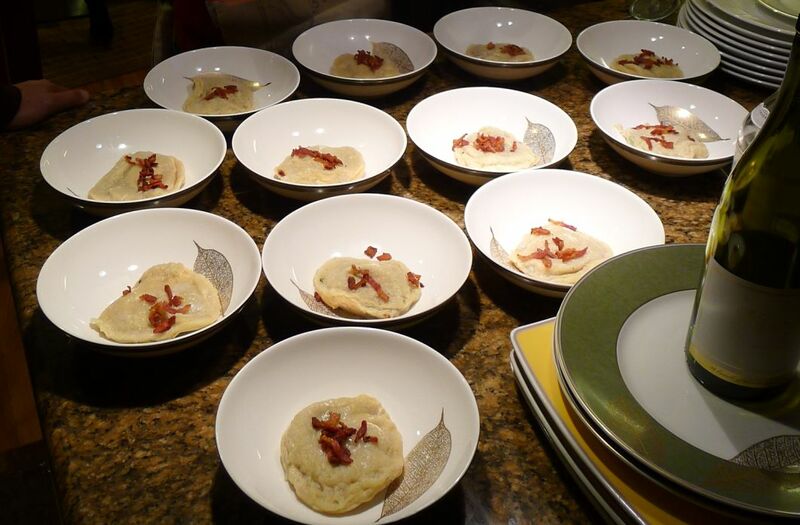 Prepare your carbonara sauce and spoon it around the ravioli.